Here is a sneak peek of the photo shoot I did with Sarah Jehan and Michelle! These shots are inspired by one of my favorite Kate Spade advertisements, but have a Glitter Guide spin to them (more details later). Since these are for promotional use I get to share the rest of the fun shots with you next week! Make sure to sign up for the Glitter Guide and follow us on Facebook and Twitter to keep up with all our glittery news! these shots look great. cannot wait to see more of the glittery fun. Love these!! :D I can't wait to see the rest! I LOVE it!! Cannot wait to see the rest of the shoot! Oh my goodness, Taylor, I love the 2nd photo so much! So fun! these are beautiful and you look fantastic! can't wait to see more and more importantly, can't wait for the Glitter Guide launch! Love these photos. What a fun shoot. Can't wait to see the rest! Love, love, love!! Can't wait to see the rest! How fabulous! That second picture is so adorable I can't stand it. I love this outfit on you. Those heels? Marvelous. I love the second one. So cute! These photos came out simply stunning!! So creative and inspiring!!! Thanks ladies!! It was so fun to come up with the concept and styling and then work with such fun ladies and have it all come together! LOVE the 2nd photo! These are great! I can't wait to see the rest! Such fun and cute pictures! Love how a bookshop was used as the setting. Looks like you forgot to wear pants! Love your shoes and the library shot! I can't wait for the official debut! and yes, anonymous comments are quite funny. AH! I love them! SO exciting!!! Taylor!!! These are SO CUTE!!! Love it! Love the second shot. Congrats! These are GORGEOUS! Can't wait to see all of the shots! I love these! 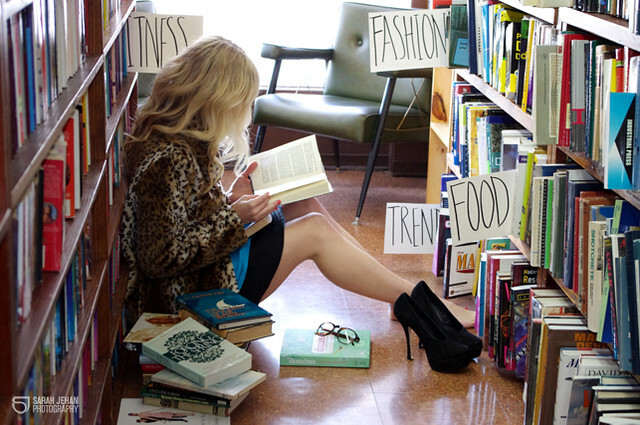 What a clever idea and I love the dress w/ the leopard coat. So wonderful! I love the library shot! You are beautiful as always. So excited for you. Congrats to everything you're accomplishing love muffin! I own this very same jacket! Looks great on you. Can't wait to see the rest of the shoot. Kate Spade truly does have the greatest adds. Thanks ladies. All your support means so much to me. It's the best feeling to work on something you're passionate about! I couldn't do it without all of you!! Leopard paired with anything immediately ups the glamo-meter...even if you're amongst a bunch of books in the least glamourous of spaces. With a shot of fuschia to the lips and touch of turq in the mix...GLAM goes through the roof! Just found your blog, you look beautiful! You look so cute! Can't wait to see more. I can't wait for the unveiling! These shots are so fun, and that leopard jacket is beautiful. these came out great Taylor, I'm excited to see the rest of them!! it's going to be the best feeling in the world launching your site! Love the Kate Spade feel of this shoot, and that coat is FABULOUS!